Toyota Hilux Revo is a high performing vehicle thanks to its new ESTEC GD diesel engines which give better performance while giving 10% better performance than D-4D engine.. 2800 cc GD-FTV offers up to 450Nm of torque, a gain of 25 per cent, while its 2400 cc sister revvs up to 400Nm. In both cases fuel use has been reduced by around 10 per cent..Even though HiLux’s 2700 cc four-cylinder VVT-i petrol engine have been retained, it has been retuned to deliver greater power, torque and fuel efficiency due to lower weight, enhanced combustion efficiency and reduced friction. The 4000 cc petrol V6 engine continues and Hilux 4000 cc will be available from our Australia office in October. Improved performance and economy of Toyota Hilux Revo are supported by new six-speed manual and automatic transmissions, including an ‘intelligent’ manual transmission that helps eliminate shift shock by matching engine revs to the transmission speed. The 2.4 litre GD Common Rail Intercooler Variable Nozzle Turbo (VNT) is a 16-Valve DOHC diesel engine. The high-power alongside with the wide flat-torque curve demonstrates an extremely efficient engine. Hence, it delivers instant power on demand along with better fuel economy and cleaner emissions that maximises power efficiency. The vanes on the turbine can automatically narrow their opening angle, increasing exhaust gas flow speed and pressure. As a result, turbine spin is increased, improving low end torque, giving stronger pulling power and acceleration at low speed. When the engine is running in the medium-to-high speed range, the exhaust gas pressure is sufficient to spin the turbine, thus improving engine output and fuel efficiency. 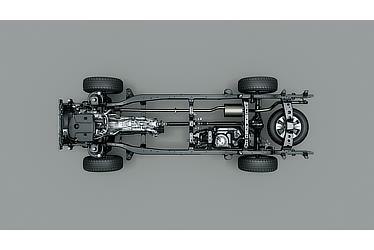 Toyota Outstanding Performance (TOP) Platform features a structurally improved, durable and sturdy frame to withstand any impact. Better handling and ride comfort are also ensured thanks to the Hilux Revo’s reliable suspension system which is now based on coil springs rather leaf springs in Toyota Hilux Vigo. High rigid TOP (Toyota Outstanding Performance) platform and advanced technologies helps Hilux powerfully and smoothly operate in all terrains as well as enhances the rigidity that enables to contribute to the quietness of the cabin and comfort . The G Toyota Hilux Revo Auto now comes with Tiptronic Transmission which is known as Sequential Shift. While you can choose to drive in automatic mode but when required you can switch to Sport mode and change the gears up and down without having to worry about a clutch. People love it because they get the power and control of manual transmission without having to learn complicated motions of different gear combinations, all they do is move the gear up and the gear is activated. In ordinary manual transmission, you can cause engine and gearbox damage if you put the car in wrong gear. With Sequential you cannot go wrong and when you are done you switch to normal auto transmission. With Automatic Disconnecting Differential (ADD), you can easily switch between 2WD and 4WD on the fly – never let any terrain or road condition get between you and your adventures ever again. *Available only for Double Cab variants. Activating this off road mode is quick and easy, thanks to a switch that’s conveniently located on your dashboard. Please read the instructions carefully. Ideally, differentials should be (manually) locked before traction is lost and wheels start spinning.They need to be switched off immediately after passing through a tough off-road section. Activation of diff locks restricts each of the two wheels on an axle to the same rotational speed without regard to available traction or differences in resistance seen at each wheel. Improper use on pavement may cause death or injury. Improper use off-road may cause component failure or severe difficulties to maneuver the truck. Traction describes the relationship or grip that your tyres have with the ground, and loss of traction is the 4WD’s number one enemy. Diff locks disable the differential’s ability to distribute torque equally and its ability to allow the wheels to rotate at different speeds. Unfortunately a diff’ lock is on or off; there is no in-between so locking it on a pavement can be very dangerous. Engaging diff lock can make the vehicle understeer (tend to go straight ahead in corners) or veer suddenly sideways if one side looses traction, like on ice.